The major market indexes are all holding up within close range of their Wednesday highs when they all gapped up on heavy volume. That action, however, did not lead to any upside follow-through on Thursday or Friday, although the indexes were perceived to pull back in relatively constructive fashion. The Dow and the S&P 500 Indexes held tight Friday along the intraday lows of Wednesday's gap-up range, while the NASDAQ Composite Index has filled Wednesday's gap but is holding up along its 10-day moving average. That said, the Focus List is seeing some names fall off as they break support. Other names also did not follow-through on strength seen Wednesday, and in fact, in a couple of cases we will discuss further below in this report, they moved lower, not higher. That may indicate that the market is susceptible to a pullback and normal correction after getting extended to the upside, and in fact we have also seen several leaders start to waver or break down in wholesale fashion. The hot IPOs from late 2016 that looked like they might be trying to round out lows of potential new bases after long declines have failed miserably. Both Nutanix (NTNX), which blew up after earnings, and Twilio (TWLO) have been removed from the list. Mosaic (MOS) violated its 50-day moving average and has also been removed from the list. Thor Industries (THOR) (Monday, 2/6 After-Hours), Momo (MOMO) (Tuesday, 2/7, Unconfirmed). Amazon.com (AMZN) is buyable here along the 10-day line and the top of its current base as volume dries up. Alibaba (BABA) is buyable within a five-week base as it tightens up along its 10-day moving average with volume drying up. Barracuda Networks (CUDA) is clinging to its 50-dma as volume declines. The stock's action is a bit puzzling following Wednesday's pocket pivot at the 10-dma, which it failed to hold on Thursday. The stock may continue tracking sideways if it can hold the 50-dma, but so far we are not impressed with its inability to follow-through on several pocket pivots within the base. 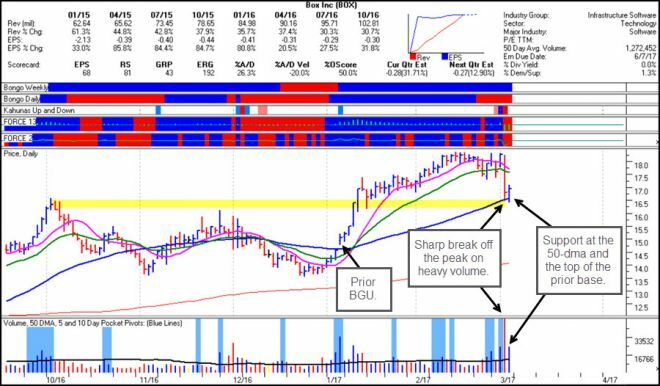 Box (BOX) reported earnings Wednesday after the close and opened up flat on Thursday before breaking below its 10-day line on heavy selling volume. It held support at its 50-dma on Friday. This coincides with the top of the prior double-bottom base and is still well above the original buyable gap-up in early January on which we reported at that time. This could put the stock in a lower-risk entry position here, taking an opportunistic approach here with the idea of using the 50-dma as a selling guide. Fortinet (FTNT) has broken below its 20-dema, which is not a constructive sign in our view. It must quickly regain the 20-dema or it will likely be removed from the list this week. In general, after a stock has a buyable gap up then trades below the low of that gap up at least 6 days later, it should be sold without allowing for any 1-2% undercut. Glaukos (GKOS) gapped up after earnings on Thursday morning but flopped in very weak fashion as it has now filled the gap. Investors clearly sold into the gap-up move on Thursday, which may indicate a near-term top for the stock. We would consider the current action as a sign to exit the stock, assuming one did not sell into the gap-up move, and allow it some time to stabilize and perhaps build a new base after getting extended to the upside. GKOS has been one of the best-performing stocks on the list in 2017 since we first reported on its buyable gap-up move in early January at 36.32. Based on Thursday's peak price of 52.49, GKOS had posted a 44% upside move since early January, which in this market represents a very strong move where profits could be taken. 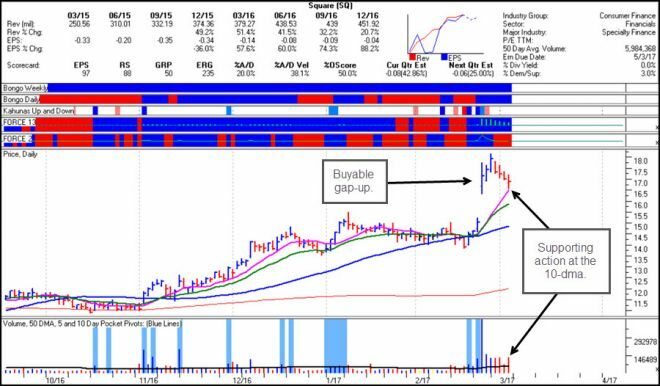 The fundamentals for the stock remain strong, so we would like to see it set up in a new base before looking to buy it again. JD.com (JD) gapped up after earnings on Thursday morning, but could not sustain the gap-up move and closed near the intraday lows for the day. 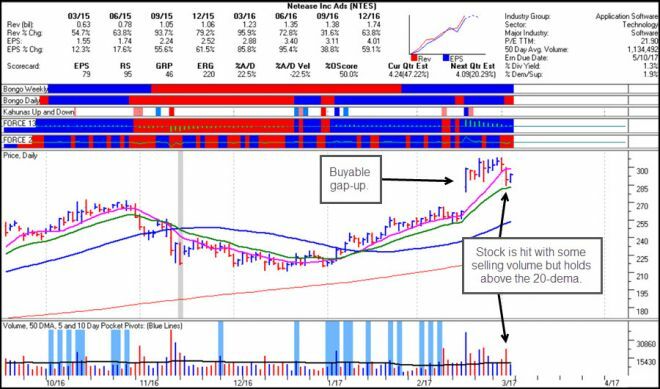 The stock has been able to hold above its 10-dma, so we would use that as a near-term selling guide to ensure that profits are maintained. JD was first reported on as a pocket pivot within the base closer to the 25 price level, so it has had a reasonable upside move since then, and may need some time to build a new base at current levels. Netflix (NFLX) has dropped below its 20-dema but held the 148.25 intraday low of its January buyable gap-up. We would keep a close eye on the stock as a breach of the 148.25 level could be a bearish development for the stock. Since its buyable gap-up in January, NFLX has not been able to mount any kind of sustainable upside. Netease (NTES) continues to flop around following its prior buyable gap-up of two weeks ago, and has been unsuccessful in several attempts to decisively clear and hold above the $300 Century Mark. NTES was able to hold above is 20-dema over the past two days after getting hit with some high-volume selling on Thursday, but this could be treated as a lower-risk entry using the 20-dema as a selling guide. Quantenna Communications (QTNA) is holding along its 20-dema and saw volume pick up slightly on Friday in a display of minor support at the line. This is in a lower-risk entry position using the 20-dema as your selling guide. Square (SQ) is pulling back after pricing an up-sized $400 million convertible note offering. On Friday the stock found support at its 10-dma which puts the stock in a lower-risk entry position using either the 10-dma or the prior 16.32 intraday low of its late February buyable gap-up as a selling guide. 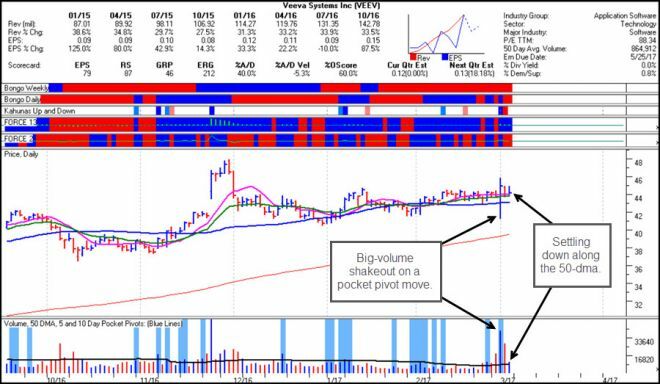 Veeva Systems (VEEV) announced earnings on Tuesday after-hours and gapped down on Wednesday before shaking sellers out and launching to the upside on heavy volume. By the close the stock had posted a pocket pivot at the 50-dma. It is trying to settle down along the 50-dma as volume declines, which puts it in a lower-risk entry position using the 50-dma as a selling guide. U.S. Steel (X) has failed on a "re-breakout" attempt but is finding support around its 20-dema. X has a tendency to be buyable on weakness within the base, often when it looks somewhat ugly, whereas chasing breakouts has not worked out for those who remain dependent on this outmoded method of buying stocks. This might offer a lower-risk entry here along the 20-dema while using the 50-dma as a maximum selling guide. Zions Bancorp (ZION) has pulled back to fill is gap-up move from Wednesday, putting it in a lower-risk entry position using the 10-dma as a selling guide.